"The question is rhetorical, but if I wasn't trying to shut up, I'd answer it: You like someone who can't like you back because unrequited love can be survived in a way that once-requited love cannot." This is the story of Will Grayson. Well, actually it's the story of Will Grayson and the other Will Grayson. Though their names might be the same, the two teenage boys couldn't be more different. One Will Grayson abides by a philosophy of apathy and silence, a mere shadow to his flamboyantly gay and very large BFF, Tiny Cooper. The other Will Grayson is a closeted gay loner who lives in a fog of angst and depression. The boys meet in a chance encounter and as their worlds collide, their lives are forever changed. I won't say more because this is one book you really need to experience for yourself! It may shock and appall you to know that I've never read a John Green book before. Oh the horror! 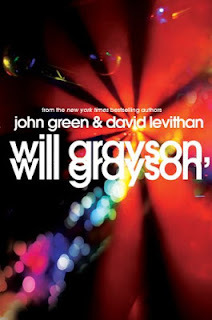 And as a Green newbie, I couldn't be happier that Will Grayson, Will Grayson was my first. Co-written with David Levithan, Will Grayson, Will Grayson is a hilarious romp featuring love, teenage drama, Tiny Cooper and the most epically gay musical you'll ever encounter. After being completely blown away by Levithan's, Every Day, I had no doubt that this book would leave me reeling. It totally did. Written in alternating perspectives, each chapter explores the life of a Will Grayson. Eventually, we see that their lives converge in a strange twist of fate and just how this meeting irrevocably impacts each of the Will's lives for the better. What's most outstanding about this book, the brilliant concept aside, is the collaborative success of David and John's writing. Each in a distinctive voice uses their Will to narrate in a very believable and impactful way. John's WG is caught up in finding himself amidst being overshadowed by his very charismatic friend. He is the average teen whose motivations are steeped in typical teenage problems. In short, he's so easy to connect with because we've all been there and done that. Levithan's WG, on the other hand, is more of a broken soul. He struggles with depression and his self awareness makes him antagonistic, at best. As raw as this WG is, he's also blatantly honest and as a reader, you find yourself rooting for him to overcome all the crap that permeates his life. About the only thing both WG's share (prior to their meeting) is their struggle to find and understand first love. Because as much as Will Grayson, Will Grayson is about growing up and finding yourself, at its core, it's a novel about love --- finding love, falling in love, platonic love, familial love and self love. And that, my friends, is a beautiful thing. So, this book has gotten its share of accolades but it's also gotten a lot flack for the over-the-top cheesiness of the ending. Everything that happens culminates in the performance of the gayest musical of all time. No, really, I'm not exaggerating this part. It is the gayest musical of all time. Yes, it's cheesy. Yes, it's over the top but that's the point! It's supposed to be! I don't think the book's critical message could've been delivered in any other way. You'll still catch me shouting out, "I APPRECIATE YOU, TINY COOPER!" from time to time. It brought me to tears (happy ones, of course!). And Tiny Cooper. OMG, let me talk about Tiny Cooper for a second. How do I even begin to describe Tiny Cooper? "Tiny Cooper is not the world's gayest person and he is not the world's largest person, but I believe he may be the world's largest person who is really, really gay, and also the world's gayest person who is really, really large." He is AH-MAZING. He's big, beautiful, he loves love and he's probably the best character ever written. Like EV-ER. The fact that he wants to use love, more specifically his very active love life via a musical, to make the world a better place, is just awe-inspiring. Tiny Cooper is the force to bring both WG's together. He's the main catalyst that incites radical changes in each of their perspectives. And with the problems that these two are facing, it takes a larger-than-life personality to do so. I'm just glad they picked a very fabulous one. In our increasingly accepting society, there's still a sad shortage of strong and relatable GLBT characters so I have to applaud Levithan and Green for making Tiny Cooper and one of the WG's so amazing. This just adds fuel to the awesomeness that is this book. Will Grayson, Will Grayson overall is raw, honest and funny. It can be offensive at times, but that just lends to its charm and adds to the freshness of its edgy, yet beautiful message. For this reason, it may not be a book that everyone can enjoy but it's a book that everyone should read because you'll be thinking about it long after you've turned the last page. You can't pick which books make you happy, but you can pick happy books so save yourself the trouble and pick Will Grayson, Will Grayson. Will Grayson, Will Grayson is an incredibly funny and insightful book that touches on issues to which everyone can relate, most notably love. The characters are relatable, the writing edgy and the concept fresh. And there's also Tiny Cooper! Tiny Cooper is reason enough to read this book. He's just awesome. Levithan and Green are a dream duo when it comes to creating an impactful reading experience that will stick with you long after you've put it down. I haven't read this book yet and I have been debating about picking up a copy for a long time. After reading your review I may just have to check it out. I never knew that each author wrote one Will Grayson character! That sounds really interesting and like it would be hard work to get them to mesh correctly. You DEFINITELY should read this one. Levithan and Green did a beautiful job with the co-writing aspect of the novel and the differences in writing style make it work because it gives both Wills such a unique voice. The book is laugh-out-loud funny and at the same time, totally endearing! The premise of this one sounds very good! I love it when authors get together like this and make it happen. I really did, Naida! It's such a well-written book with really engaging characters. I ADORED it! And I'm eager to hear what you think about Every Day.